We recently showed that lovastatin attenuates cyclosporin A (CsA)-induced damage of cortical collecting duct (CCD) principal cells by reducing intracellular cholesterol. Previous studies showed that, in cell expression models or artificial membranes, exogenous cholesterol directly inhibits inward rectifier potassium channels, including Kir1.1 (Kcnj1; the gene locus for renal outer medullary K+ [ROMK1] channels). Therefore, we hypothesized that lovastatin might stimulate ROMK1 by reducing cholesterol in CCD cells. Western blots showed that mpkCCDc14 cells express ROMK1 channels with molecular masses that approximate the molecular masses of ROMK1 in renal tubules detected before and after treatment with DTT. 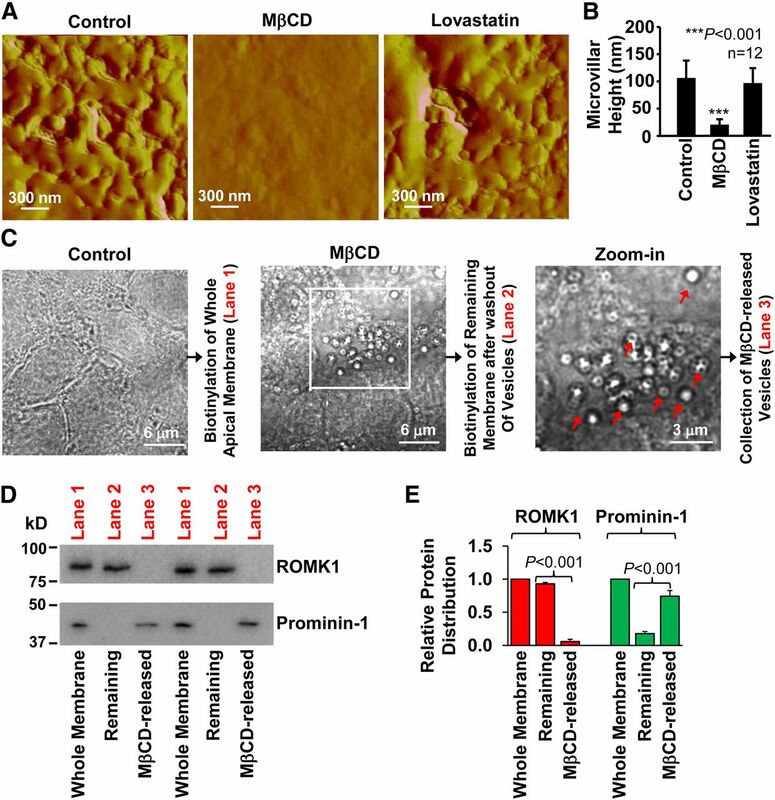 Confocal microscopy showed that ROMK1 channels were not in the microvilli, where cholesterol-rich lipid rafts are located, but rather, the planar regions of the apical membrane of mpkCCDc14 cells. Furthermore, phosphatidylinositol-4,5-bisphosphate [PI(4,5)P2], an activator of ROMK channels, was detected mainly in the microvilli under resting conditions along with the kinase responsible for PI(4,5)P2 synthesis, phosphatidylinositol-4-phosphate 5-kinase, type I γ [PI(4)P5K I γ], which may explain the low basal open probability and increased sensitivity to tetraethylammonium observed here for this channel. Notably, lovastatin induced PI(4)P5K I γ diffusion into planar regions and elevated PI(4,5)P2 and ROMK1 open probability in these regions through a cholesterol-associated mechanism. However, exogenous cholesterol alone did not induce these effects. These results suggest that lovastatin stimulates ROMK1 channels, at least in part, by inducing PI(4,5)P2 synthesis in planar regions of the renal CCD cell apical membrane, suggesting that lovastatin could reduce cyclosporin-induced nephropathy and associated hyperkalemia. Inward rectifier potassium (Kir) channels play an important role in regulating neuronal signaling, heart rate, blood flow, insulin release, and potassium homeostasis in the blood. These functions are closely associated with the complex channel structure1 that controls channel membrane density, gating, and assembly.2–6 K+ balance in the blood is tightly regulated by a K+ channel in the kidney, the so-called renal outer medullary K+ (ROMK) channel. ROMK1 is a member of the Kir channel superfamily and responsible for renal K+ handling. ROMK1 (Kir1.1; gene locus Kcnj1) is the major isoform of ROMK channels expressed along the distal nephron.7,8 The ROMK1 channel in cortical collecting ducts (CCDs) has a small conductance; therefore, it is also termed the small conductance K+ (SK) channel.9 This channel may be responsible for drug-induced hyperkalemia, because cyclosporin A (CsA), an immunosuppressant drug that causes hyperkalemia, inhibits the channel.10,11 However, the mechanism by which CsA inhibits ROMK1 channels remains unclear. Our recent studies suggest that CsA stimulates the epithelial sodium channel (ENaC) through elevation of intracellular cholesterol.12 Interestingly, cholesterol inhibits Kir channels,13–15 including the Kir 1.1 (ROMK1) channel.16 Therefore, CsA-induced elevation of cholesterol in CCD cells may account, at least in part, for CsA inhibition of ROMK channels. Recently, we have shown that CsA causes damage to CCD cells by elevating intracellular cholesterol and that lovastatin antagonizes the CsA-induced damage by reducing intracellular cholesterol.17 Therefore, investigating how lovastatin regulates ROMK1 channels may provide insight into clinical problems, such as CsA-induced hyperkalemia. Previous evidence suggests that exogenous cholesterol inhibits Kir channels by direct interaction with the channel cytosolic pore, possibly through hydrogen bonds.13–16 However, the evidence came from either cell overexpression models or artificial bilayer membranes. Because endogenous cholesterol, especially in epithelial cells, is usually strongly associated with sphingolipids through hydrogen bonds in the cell membrane to form lipid rafts,18 it remains unclear whether the endogenous cholesterol could reach and interact with the cytosolic pore of Kir channels, although the exogenously added cholesterol can. In contrast to the tightly packed cholesterol, another membrane lipid, phosphatidylinositol-4-phosphate 5 P2 [PI(4,5)P2], is relatively free and strongly stimulates Kir channels through a direct interaction between PI(4,5)P2 and the channels.19–21 Because alteration of the putative cholesterol binding site of Kir2.1 also affects the sensitivity of the channels to PI(4,5)P2,13 it is possible that PI(4,5)P2 also participates in the regulation of Kir channels by cholesterol. Compared with cholesterol, the binding of PI(4,5)P2 to Kir channels is through electrostatic interactions,22 which are possibly stronger than the weaker hydrogen bonds presumably formed between cholesterol and Kir channels. PI(4,5)P2 is typically localized in cholesterol-rich lipid rafts.23 However, depletion of cholesterol can cause PI(4,5)P2 redistribution between lipid rafts and nonlipid raft regions.24 These studies together suggest that cholesterol may indirectly regulate Kir channels by modulating PI(4,5)P2 localization. In this study, for the first time, we show that phosphatidylinositol-4-phosphate 5-kinase, type I γ [PI(4)P5K I γ] and its product PI(4,5)P2 are normally located in microvilli (morphologically specialized apical membranes of CCD cells) and that lovastatin stimulates ROMK1 channels, at least in part, by inducing PI(4)P5K diffusion into planar regions where ROMK1 is located. Previous studies suggest that ROMK1 channels are expressed in the apical membrane of isolated CCD with a small single-channel conductance.9 However, unpublished studies from several research groups indicate that cultured CCD cells (mouse CCD principal cell line [mpkCCDc14]) do not contain the ROMK1 channel with the previously described molecular mass. Consistently, our data show that, in mpkCCDc14 cell lysate, a single band with molecular mass between 75 and 100 kD is detected by two types of ROMK antibodies, whereas multiple bands are detected in kidney tissue (Figure 1A). The single 70- to 100-kD band was also observed in the kidney tissue from wild-type mice but was not detectable in the kidney tissue from ROMK knockout mice. There are several possible explanations for the different molecular mass bands. Other investigators have suggested that ROMK1 can undergo varying degrees of glycosylation that cause it to run as several bands depending on the state of glycosylation.25 Alternatively, ROMK1 might form homomultimers in cultured mpkCCDc14 cells by hidden disulfide bonds. We did find that treatment of the cells for 24 hours with 250 μM TEMPOL (a superoxide dismutase mimetic and reactive oxygen species scavenger) reduced the higher molecular mass forms of ROMK1 in mpkCCDc14 cells (Figure 1B). Regardless, our results do not directly address the issue of the form of ROMK1 in the membrane. However, to determine the levels of ROMK1 (whether as the higher or lower molecular mass form) in the apical membranes of renal tubules, we performed in situ biotinylation experiments, which we have previously reported.26 Interestingly, much higher molecular mass ROMK1 than lower was detected in the apical membranes of renal tubules (Figure 1C); 100 mM DTT significantly decreased the amount of higher molecular mass ROMK1 in the biotinylated apical membranes of renal tubules (Figure 1, D and E). As shown in Supplemental Figure 1, the single band detected by an ROMK antibody from Alomone Laboratories was significantly reduced in mpkCCDc14 cells transiently transfected with siRNA against ROMK1 but was not altered by control siRNA; 100 mM DTT caused disappearance of the higher molecular mass band and induced appearance of another band with a molecular mass <50 kD. These data suggest that ROMK1 exists in a higher molecular mass form in mpkCCDc14 cells that can be converted to a low molecular mass form by strong reducing agents, but in the kidney, ROMK1 channels are present in both the high and low molecular mass forms, although the high molecular mass form is the predominant form in the apical membranes of renal tubules. ROMK1 on Western blots runs at a higher molecular mass than expected in cultured mpkCCDc14 cells. (A) Western blots from mpkCCDc14 cells or kidney tissue of wild-type (WT) or ROMK knockout (KO) mice. (Left panel) ROMK1 channels in the same gel were first probed with a commercial ROMK1 antibody from Alomone Laboratories (Alomone Ab), and then, the membrane was completely stripped and reprobed with another ROMK1 antibody provided by Paul Welling at the University of Maryland Medical School (R79 AP-4 Ab). (Right panel) ROMK1 channels in a different gel were also detected with R79 AP-4 Ab. (B) Western blot from either control mpkCCDc14 cells or the cells treated for 24 hours with 250 μM TEMPOL, a superoxide dismutase mimetic and ROS scavenger. (C) Both the higher molecular mass form of ROMK1 and the lower molecular mass form were detected in lysate from whole kidney, whereas only the higher molecular mass form of ROMK1 was detected in apical membrane protein extract from in situ biotinylated renal tubules. (D) Treatment of apical membrane protein extract of renal tubules with 100 mM DTT decreased the higher molecular mass form and increased the lower molecular mass form of ROMK1. (E) Summary plots of the two forms of ROMK1 in apical membranes of renal tubules in the absence or presence of DTT. Methods for preparing cell lysates are the same for mpkCCDc14 cells and kidney tissue. Each experiment was repeated three times and showed consistent results. DTT, dithiothreitol. 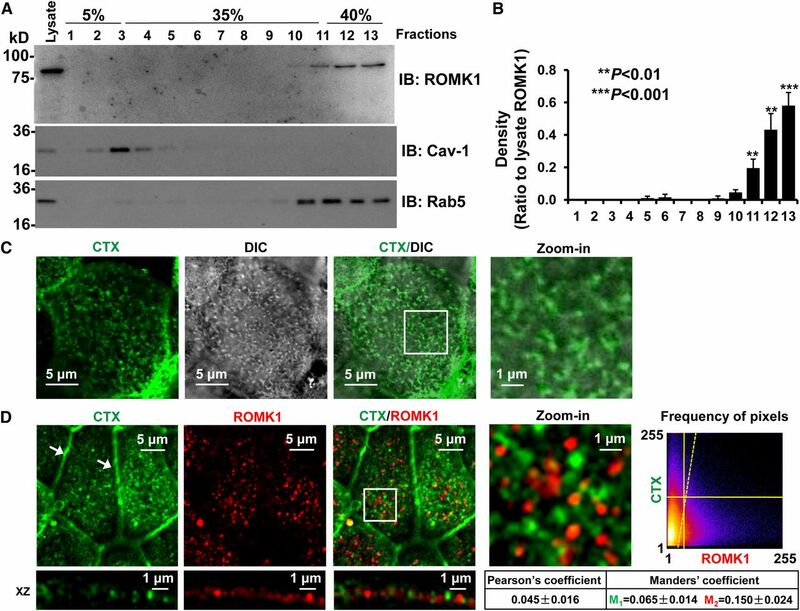 To examine the single-channel activity of the ROMK1 channels in mpkCCDc14 cells, we performed both cell-attached and inside-out patch-clamp experiments. As shown in Figure 2A, in total, six cell-attached patches were formed on the apical membrane of mpkCCDc14 cells, with patch pipettes filled with KCl pipette solution containing 145 mM K+. The current–voltage relationship showed that the single-channel current inwardly rectified with a chord conductance of 29.1±0.9 pS (n=6) between −60 and −40 mV (cell interior potential with respect to the pipette potentials [−Vpipette]), which is similar to the characteristics of the SK channels previously described in isolated CCD.27,28 In inside-out patches, the channel was reversibly blocked by tetraethylammonium (Figure 2B). To confirm that this SK channel is ROMK1, the cells were either left under control conditions or transiently transfected with ROMK1 siRNA or control siRNA. The frequency of observing the SK channels in cell-attached patches was significantly reduced in the cells transfected with ROMK1 siRNA but not cells transfected with control siRNA (Figure 2, C and D). Western blots showed that ROMK1 protein was significantly reduced in the cells transfected with ROMK1 siRNA but not control siRNA (Figure 2, E and F). ROMK1 channel is expressed in the apical membrane of mpkCCDc14 cells. (A, Left panel) Current-voltage relationship summarized from six cell-attached patches. (A, Right panel) Single-channel currents from a representative cell-attached patch versus the potentials applied to the patch pipette (Vpipette), which indicated by −Vpipette (millivolts). C- and dashed lines along with single-channel current traces show baselines where the channels are closed. (B) Channel activity in (left panel) an inside-out patch was blocked by 10 mM tetraethylammonium (TEA) applied to (center panel) the cytoplasmic bath, and (right panel) the blockade was reversed after washing TEA out of the bath. A voltage step protocol from −80 to 80 mV with 80-mV increments at a holding potential of 0 mV, as indicated by Vm (millivolts), was applied to the patch pipette. (C) Appearance of the channel in the patch was significantly reduced in the cells transfected with ROMK1 siRNA but not control siRNA. Downward events show inward currents through open channels. (D) Summary plots of percentages of patches containing ROMK1 channel activity in cell-attached patches formed on control cells (n=20) or cells transfected with either ROMK1 siRNA (n=18) or control siRNA (n=16). Data are from four separate experiments. (E) Western blot from control cells or cells transfected with either ROMK1 siRNA or control siRNA. β-actin in the same loading membrane was immunoprecipitated with antibody to β-actin and used to evaluate the amount of loaded protein. (F) Summary plots of relative ROMK1 protein levels from four separate Western blot experiments. Previous studies suggest that Kir 1.1 (ROMK1), when artificially expressed in Xenopus oocytes, is directly regulated by experimentally added cholesterol.16 Because cholesterol is a component of lipid rafts,18,29 we originally hypothesized that ROMK1 might be in lipid rafts and that endogenous cholesterol could directly regulate the channel. Surprisingly, our data from sucrose gradient experiments showed that the ROMK1 channel was detected mainly in nonlipid raft membranes (Figure 3, A and B). To confirm that ROMK1 channels are not in lipid rafts, we labeled lipid rafts with fluorescence-tagged cholera toxin (CTX) and ROMK1 with ROMK1 antibody. Previous studies have shown that CTX is exclusively located in the microvilli of apical membranes of epithelial cells.30 Consistently, confocal microscopy showed that CTX-probed lipid rafts were exclusively detected in the microvilli of mpkCCDc14 cells and that the ROMK1 channel was not colocalized with the lipid rafts (Figure 3, C and D). Quantitative analysis with ImageJ showed that Pearson coefficient was 0.045±0.016, whereas Manders coefficients were 0.065±0.014 (M1) and 0.150±0.024 (M2). These data suggest that ROMK1 channels are separated from cholesterol-rich lipid rafts which are exclusively located in microvilli. ROMK1 channels are not located in lipid rafts. (A) Sucrose gradient experiments showed that ROMK1 is located in nonlipid raft regions. Caveolin-1 (Cav-1) was used as a control protein that is known to be located in lipid rafts, whereas Rab5 was used as a control protein that is known to be located in nonlipid raft membranes. IB, immunoblotting. (B) Summary plots of four sucrose gradient experiments. (C) Confocal microscopy fluorescent image merged with a DIC image shows that CTX (green) is mainly located in microvilli (microvilli were visualized through DIC imaging). (D) Confocal microscopy shows that ROMK1 (red) is not located in lipid rafts probed by fluorescence-tagged CTX (green). Here and in other figures, all confocal microscopy xy optical sections were taken near the apical membrane of mpkCCDc14 cells, which is evidenced by tight junctions (white arrows); white rectangular boxes indicate zoomed-in areas shown in the Zoom-in panels. Frequency of pixels was analyzed with the ImageJ program, and the images represent data from at least four separate experiments that showed consistent results. All confocal microscopy images in this study were taken using the same parameter settings, including gain, contrast, and pinhole. DIC, differential interference contrast. In the following experiments, prominin-1 was used as a biomarker of microvilli.30 The data show that the ROMK1 channel is not colocalized with prominin-1 (Pearson coefficient was 0.064±0.017, whereas Manders coefficients were 0.058±0.017 [M1] and 0.126±0.014 [M2]) (Figure 4A) but rather, located in planar regions, where lipid rafts are rarely found. The microvillar localization of lipid rafts and the planar region localization of ROMK1 channels were also confirmed by merging the fluorescent images with differential interference contrast (DIC) images, which are shown in Supplemental Figure 2. In the cells transfected with ROMK1 siRNA, the fluorescence-labeled ROMK1 channels were significantly reduced. However, control siRNA did not alter ROMK1 expression (Figure 4, B–D). Previous studies have shown that acute depletion of membrane cholesterol with MβCD promotes release of extracellular vesicles from microvilli.31 This provides a unique method to isolate proteins located in microvilli from those located in planar regions. We used atomic force microscopy to detect whether depletion of cholesterol could eliminate microvilli from the apical membrane. The data showed that treatment of mpkCCDc14 cells with 50 mM MβCD for 30 minutes but not with 10 μM lovastatin for 12 hours almost completely eliminated microvilli from the apical membrane (Figure 5, A and B). The MβCD-released vesicles formed by microvilli can be visualized through a conventional microscope (Figure 5C). Therefore, Western blot experiments were performed by using biotinylated whole apical membrane under control conditions containing both microvilli and planar regions of the apical membrane for lane 1, biotinylated remaining membrane after washing out MβCD-excised microvilli for lane 2, and lysates from MβCD-excised microvilli for lane 3. The data showed that ROMK1 was mainly in the planar regions and that prominin-1 (a microvillar protein), as a control, was mainly in microvilli (Figure 5, D and E). These data further suggest that ROMK1 channels are located in planar regions, which are separated from cholesterol-rich lipid rafts found in microvilli. ROMK1 channels are mainly located in the planar region. (A–C) Confocal microscopy images of prominin-1 (a biomarker of microvilli; green) merged with ROMK1 (red) show that ROMK1 was separated from prominin-1 in control mpkCCDc14 cells and that ROMK1 was almost undetectable in mpkCCDc14 cells treated with ROMK1 siRNA but still observed in mpkCCDc14 cells treated with control siRNA. (D) Fluorescent intensity of either prominin-1 (green) or ROMK1 (red) was quantified with the ImageJ program, showing that ROMK1 levels were significantly reduced in ROMK1 siRNA-treated cells. A major fraction of ROMK1 channels is located in planar regions. (A and B) Atomic force microscopy shows that acute extraction of cholesterol with MβCD (50 mM for 30 minutes) but not lovastatin (10 μM for 12 hours) eliminated microvilli (A, representative image; B, summary plots of microvillar height). (C) Depiction of the methods used for preparation of the whole apical membrane and separation of microvilli from planar regions. Biotinylation of either the whole apical membrane or the remaining membrane after washing out MβCD-released vesicles (planar regions) was used for lane 1 or 2, respectively, in the Western blots shown in D, whereas MβCD-released vesicles (microvilli) were used for lane 3. MβCD excised microvilli to form vesicles, which are indicated by red arrows. The white rectangular box in C indicates the zoomed-in area shown in the Zoom-in panel. (D) Western blots of the whole apical membrane (whole membrane; lane 1), the remaining apical membrane after washing out vesicles (planar regions; lane 2), and MβCD-released vesicles (microvilli; lane 3). The whole blots are shown in Supplemental Figure 3. (E) Summary plots of relative ROMK1/prominin-1 distribution between planar regions and microvilli (n=4). Because they are biotinylation experiments, we used a double immunoblotting method to eliminate a possible difference in protein loadings, which is shown in Supplemental Figure 4. First, we immunoblotted the membrane with an antibody to ROMK1. Second, the lower part of the membrane that carries prominin-1 was separated from the top part of the membrane that carries ROMK1 and immunoblotted with an antibody to prominin-1. The arrows in C indicate where the separated membrane was fused back together to show that they were from the same gel. In the same lane for microvilli, where ROMK1 was undetectable, significant prominin-1 was observed. Conversely, in the same lane for planar regions, where prominin-1 was undetectable, significant ROMK1 was observed. 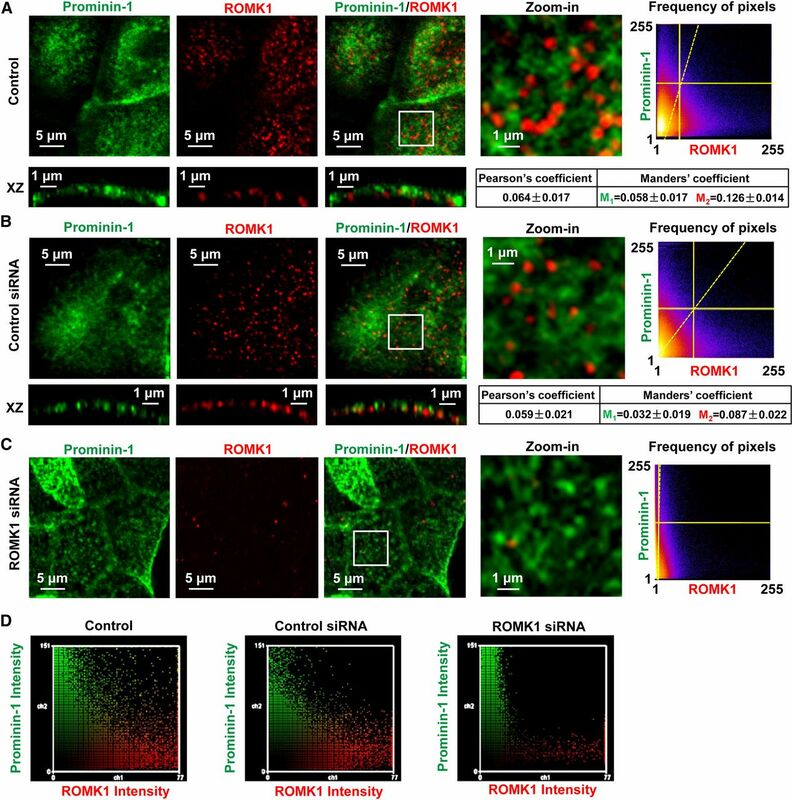 These data suggest that neither undetectable ROMK1 in microvilli nor undetectable prominin-1 in planar regions are caused by an insufficient protein loading. Our recent studies have shown that cholesterol can be locally synthesized in CCD cells and that the cholesterol synthesis can be inhibited by lovastatin, an inhibitor of 3-hydroxy-3-methylglutaryl-CoA reductase.17 Depletion of cholesterol can cause PI(4,5)P2 redistribution between lipid rafts and nonlipid raft regions.24 To determine whether the microvillar localization of PI(4,5)P2 in the planar regions can be altered by chronic manipulation of cholesterol with lovastatin, PI(4,5)P2 in mpkCCDc14 cells was probed by transiently transfecting the cells with enhanced green fluorescence protein (EGFP)-tagged pleckstrin homology domain of phospholipase C δ1. The image of green fluorescence representing PI(4,5)P2 was merged with the DIC image. For the first time, we found that, under resting conditions, PI(4,5)P2 was mainly detected in microvilli (Figure 6A). However, treatment of the cells with 10 μM lovastatin for 12 hours caused appearance of PI(4,5)P2 in the planar regions where the ROMK1 channel is located. The effect was abolished by cotreatment of the cells with 10 μg/ml cholesterol, but cholesterol alone did not affect microvillar localization of PI(4,5)P2 (Figure 6, B and C). These data suggest that lovastatin elevates PI(4,5)P2 in planar regions, probably by reducing intracellular cholesterol. Lovastatin causes the appearance of PI(4,5)P2 in planar regions through a cholesterol-associated mechanism. (A) A confocal microscopy fluorescent image merged with a DIC image shows that PI(4,5)P2 (green) is mainly located in microvilli of the apical membrane of live mpkCCDc14 cells (microvilli were visualized through DIC imaging as shown by the red arrows). Note that, as shown in Supplemental Figure 5, topographic images of the apical membrane of live mpkCCDc14 cells from scanning ion conductance microscopy show that microvilli can be in either single forms or ridges (also as detected with DIC images; Figure 3C [single forms] versus A [ridges]). To label PI(4,5)P2, mpkCCDc14 cells were transiently transfected with the EGFP-tagged pleckstrin homology domain of PLCδ1. (B) Confocal microscopy lateral view of PI(4,5)P2 in (upper left panel) control cells, (upper right panel) cells treated for 12 hours with 10 μM lovastatin alone, (lower left panel) cells treated for 12 hours with 10 μg/ml cholesterol alone, or (lower right panel) cells treated for 12 hours with 10 μM lovastatin plus 10 μg/ml cholesterol. Live cells were used in these experiments. (C) Summary plots of relative PI(4,5)P2 levels (fluorescent intensity ratio: planar regions/microvilli). In each experiment, 15 areas from either microvilli (blue ellipses in B) or planar (red rectangles in B) regions were selected with confocal microscopy software and paired. Four separate experiments were carried out for each experimental manipulation. DIC, differential interference contrast. To determine whether PI(4,5)P2 is compartmentally synthesized in microvilli, confocal microscopy and prominin-1 (as a biomarker of microvilli) were also used to localize PI(4)P5K I γ. Indeed, PI(4)P5K I γ was detected exclusively in microvilli. Quantitative analysis with ImageJ showed that PI(4)P5K I γ is colocalized with prominin-1 (Pearson coefficient was 0.726±0.048 and Manders coefficients were 0.716±0.060 [M1] and 0.818±0.034 [M2]). After treatment of the cells with 10 μM lovastatin for 12 hours, PI(4)P5K I γ diffused from microvilli to planar regions; Pearson coefficient was significantly decreased to 0.238±0.042, whereas Manders coefficients were reduced to 0.481±0.070 (M1) and 0.318±0.076 (M2). The effects were abolished by cotreatment of the cells with 10 μg/ml cholesterol (Figure 7A). Western blots also showed that PI(4)P5K I γ was mainly detected in microvilli rather than planar regions under resting conditions but diffused into planar regions after lovastatin treatment. The lovastatin-induced diffusion of PI(4)P5K I γ was abolished by cotreatment of the cells with cholesterol. The disassociation of PI(4)P5K I γ from prominin-1 is not caused by a possible diffusion of prominin-1, because Western blots showed that the majority of prominin-1 was still located in microvilli (Figure 7B). Because PI(4)P5K I γ is a major kinase that phosphorylates PI(4)P at five positions to produce PI(4,5)P2,32 these data indicate that lovastatin may regulate ROMK1 channels by inducing PI(4)P5K I γ diffusion into planar regions to initiate PI(4,5)P2 synthesis near the channel. 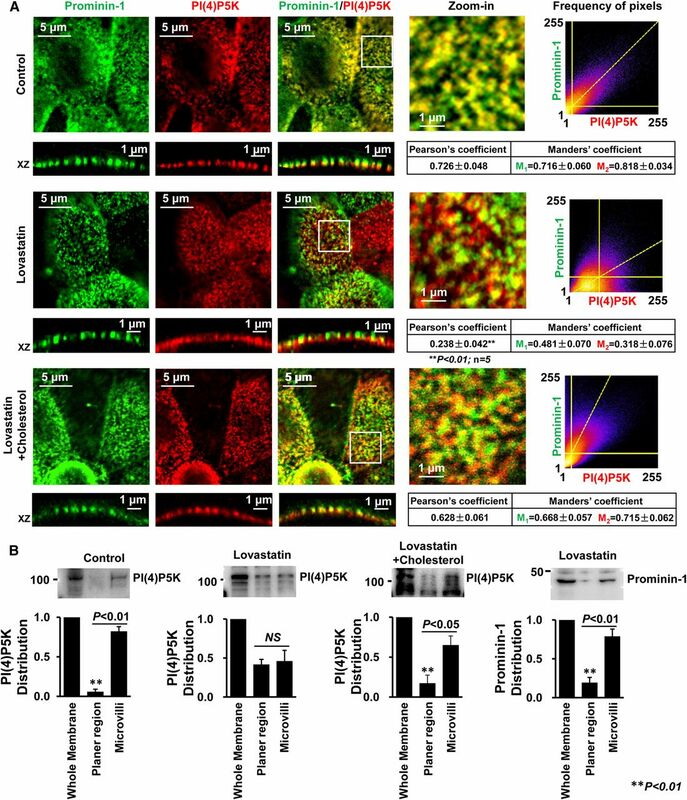 PI(4)P5K is localized in microvilli under resting conditions and diffused into planar regions after lovastatin treatment. (A, top panel) Confocal microscopy shows that, in control mpkCCDc14 cells, PI(4)P5K I γ (red) is colocalized with prominin-1 (green) in microvilli, which is shown in yellow. (A, center panel) In contrast, treatment of cells with 10 μM lovastatin for 12 hours induced diffusion of PI(4)P5K I γ into planar regions; (A, bottom panel) however, the effect was attenuated by cotreatment of cells with 10 μg/ml cholesterol. 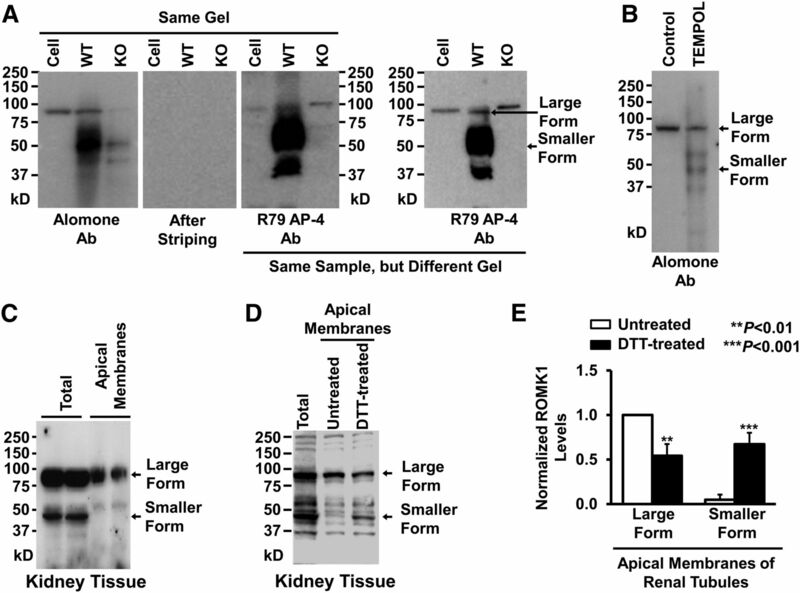 (B) Biotinylation experiments were performed as depicted in Western blot experiments shown in Figure 5; the full blot is shown in Supplemental Figure 6. Relative distributions of PI(4)P5K and prominin-1 between microvilli and planar regions are summarized in bar graphs. Data are from four individual experiments showing consistent results. To determine the role of PI(4,5)P2 in the regulation of ROMK1 channels by lovastatin, cell-attached patch-clamp experiments were performed in control mpkCCDc14 cells and mpkCCDc14 cells transfected with either control siRNA or PI(4)P5K I γ siRNA. The cells were either under control conditions or treated for 12 hours with 10 μM lovastatin in the absence or presence of 10 μg/ml cholesterol. In control mpkCCDc14 cells, lovastatin significantly elevated ROMK1 PO from 0.55±0.13 (control) to 0.90±0.10 (P<0.001; n=10), but in the presence of cholesterol, lovastatin failed to alter ROMK1 PO (0.61±0.13 versus 0.55±0.13 [control]; P=0.12; n=10). Cholesterol alone did not affect ROMK1 PO (0.47±0.11 versus 0.55±0.13 [control]; P=0.15; n=10). However, in mpkCCDc14 cells transfected with PI(4)P5K I γ siRNA, lovastatin failed to significantly alter ROMK1 PO, regardless of whether the cells were cultured without (0.55±0.14 versus 0.44±0.16 [control]; P=0.05; n=10) or with exogenous cholesterol (0.54±0.13 versus 0.44±0.16 [control]; P=0.10; n=10) (Figure 8, A and B). Exogenous cholesterol alone did not affect ROMK1 PO (0.43±0.15 versus 0.44±0.16 [control]; P=0.10; n=10). Knocking down PI(4)P5K I γ expression with its siRNA was confirmed with Western blot experiments, which are shown in Figure 8C. 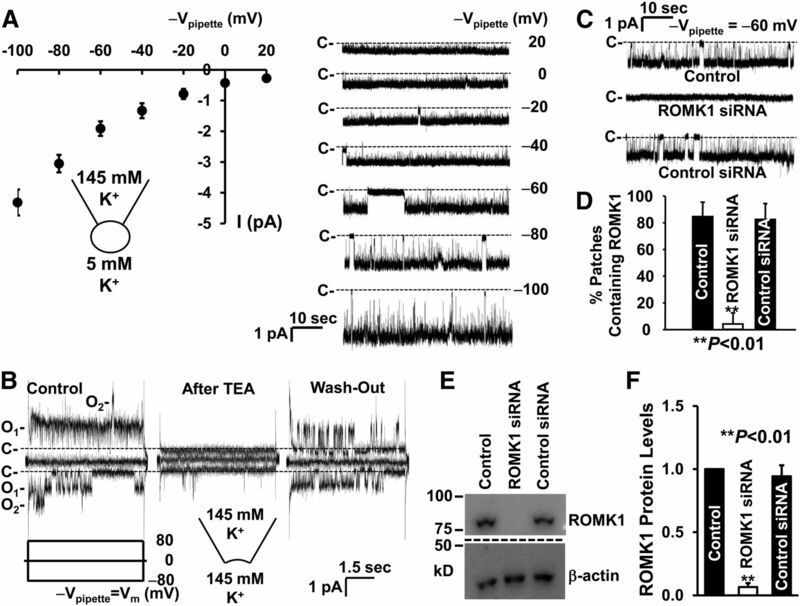 Because PI(4,5)P2 can directly activate Kir channels, including ROMK1 channels,19,27,33 these data suggest that lovastatin-induced redistribution of PI(4)P5K I γ results in elevation of PI(4,5)P2 in the planar regions to stimulate ROMK1 channels in CCD cells. 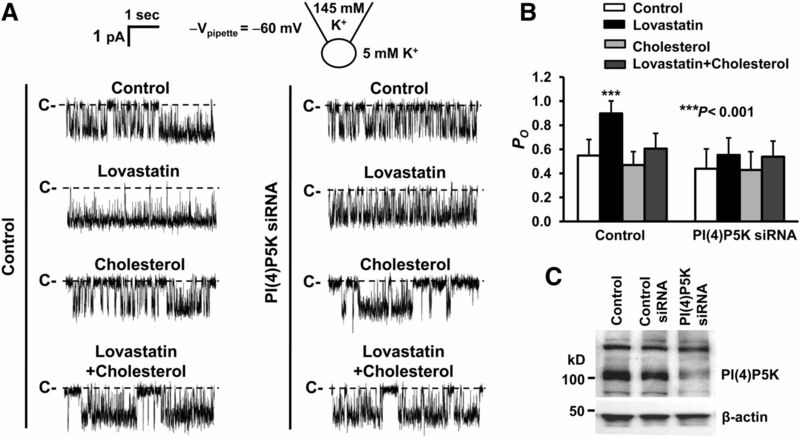 Lovastatin stimulates ROMK1 channels through a cholesterol-associated, PI(4)5K I γ-dependent mechanism. (A) Representative single-channel records from cell-attached patches formed on a control cell, a cell treated for 12 hours with 10 μM lovastatin alone, a cell treated for 12 hours with 10 μg/ml cholesterol alone, or a cell treated for 12 hours with 10 μM lovastatin plus 10 μg/ml cholesterol when these cells were either (left panel) under control conditions or (right panel) transfected with siRNA of PI(4)P5K I γ. (B) Summary plots of ROMK1 PO under these conditions. (C) Representative Western blot from four separate experiments consistently shows that transfection of mpkCCDc14 cells with siRNA against PI(4)5K I γ reduced PI(4)5K I γ expression. Previous reports suggest that Kir channels, including ROMK1 channels, are directly inhibited by cholesterol in either cell expression models or artificial membranes.13–16 However, in CCD cells, our data indicate that ROMK1 is not located in cholesterol-rich lipid rafts but mainly, the planar regions of the apical membrane and that the cholesterol-lowering drug, lovastatin, does not alter ROMK1 channel activity in the CCD cells when PI(4)P5K I γ expression is significantly reduced. These results suggest that the endogenous cholesterol levels in the planar regions, at least under resting conditions, are unable to reach the threshold that is required to directly inhibit ROMK1 channels but indirectly regulate ROMK1 channels through PI(4)P5K. For the first time, we show that the activator of ROMK1 channels, PI(4,5)P2, is mainly located in microvilli, which is separated from ROMK1 channels, and that lovastatin causes PI(4)P5K I γ diffusion into the planar regions and promotes PI(4,5)P2 synthesis to stimulate ROMK1 channels by a cholesterol-dependent mechanism. Compared with the previously described ROMK1 channels, ROMK1 channels in cultured mpkCCDc14 cells have reduced open probability and increased sensitivity to tetraethylammonium. The specific reasons for these differences are not completely clear but likely involve changes in the local availability of PI(4,5)P2. We have previously shown that CsA elevates intracellular cholesterol in distal nephron cells12 and that lovastatin antagonizes CsA-induced damage of CCD cells.17 Therefore, this study opens a new avenue for investigators to determine whether lovastatin can be used for treatment of CsA-induced hyperkalemia. In addition to ROMK1, ENaC is also regulated by cholesterol34,35 and PI(4,5)P2.36–38 However, unlike ROMK1 channels, ENaC appears to be localized in microvilli.39 Therefore, investigating how cholesterol and PI(4,5)P2 regulate ENaC in microvilli would serve as interesting topics for our future studies. Recent studies have identified ROMK polymorphisms that prevent the channel trafficking to the plasma membrane40 and also shown that high dietary potassium promotes ROMK trafficking to the plasma membrane.25 It would be interesting to investigate whether ROMK polymorphisms and high dietary potassium could alter the planar region localization of ROMK channels. Therefore, this study also provides a new platform for further defining a dynamic model of interactions between lipids and proteins in the specialized membrane structures, such as microvilli, planar regions, or even more interesting, membrane structure cilia. The mpkCCDc1441 cells were used in the study and cultured on Transwell inserts with permeable polyester membranes like we previously reported.42 Briefly, the mpkCCDc14 cells were incubated in a 1:1 mix of DMEM:F12 medium (Invitrogen, Carlsbad, CA) supplemented with 50 nM dexamethasone, 1 nM triiodothyronine, 20 mM Hepes, 2 mM l-glutamine, 0.1% penicillin/streptomycin, and 2% heat-inactivated FBS. Cells were maintained at 37°C with 5% CO2 in air for 2 weeks until they formed a confluent monolayer and became fully polarized. Mouse kidney tissue was provided by Tong Wang at Yale University. To knockdown the expression of either ROMK1 channels or PI(4)P5K I γ, mpkCCDc14 cells were transiently transfected with siRNAs directed against either ROMK1 (sc-42633; Santa Cruz Biotechnology) or PI(4)P5K I γ (sc-39183; Santa Cruz Biotechnology) according to the protocol provided by the manufacturer. Cells incubated with either only siRNA transfection reagent (sc-29528; Santa Cruz Biotechnology) in siRNA transfection medium (sc-36868; Santa Cruz Biotechnology) or nontargeted siRNAs (sc-37007; Santa Cruz Biotechnology) served as controls. Patch-clamp and Western blot experiments using these cells were carried out during the period from 60 to 72 hours after the transfections. Most chemicals were obtained from Sigma-Aldrich NaCl bath solution for all of the experiments contained 145 mM NaCl, 5 mM KCl, 1 mM CaCl2, 1 mM MgCl2, and 10 mM Hepes (pH was adjusted to 7.4 with NaOH). For patch-clamp experiments, KCl pipette solution contained 145 mM KCl, 5 mM NaCl, 1 mM MgCl2, and 10 mM Hepes (pH was adjusted to 7.4 with KOH). KCl bath solution contained 145 mM KCl, 5 mM NaCl, 1 mM MgCl2, and 10 mM Hepes (50 nM free Ca2+ after titration with 1 mM EGTA; pH was adjusted to 7.4 with KOH). All of the concentrations throughout this work are shown as the final concentrations. Both cell-attached and inside-out patch-clamp recordings of ROMK1 single-channel currents from mpkCCDc14 cells were carried out using an Axopatch 200B amplifier (Molecular Devices, Sunnyvale, CA). Before the experiments, mpkCCDc14 cells cultured on the polyester membrane of Snapwell inserts were thoroughly washed with NaCl bath solution (see Chemicals and Solutions). The glass micropipette was filled with KCl pipette solution (the pipette resistance is 7–10 MΩ). In cell-attached experiments, NaCl bath solution was used for both the luminal and basolateral baths. For experiments using the inside-out patch-clamp configuration, KCl bath solution was used for the cytoplasmic bath. Single-channel currents were obtained with different applied pipette potentials, filtered at 1 kHz, and sampled every 50 µs with Clampex 10 software. All experiments were conducted at room temperature. The total number of functional channels in the patch was estimated by observing the number of peaks detected on the current amplitude histograms during at least a 10-minute recording period. To compare the difference in channel activity between control and treated groups, the open probability (PO) of the ROMK1 channel was calculated using Clampfit 10. Confocal microscopy experiments were performed similarly to what we previously reported.43 Briefly, to detect the localization of ROMK1, prominin-1, and PI(4)P5K I γ in mpkCCDc14 cells, the cells were fixed with 4% paraformaldehyde for 10 minutes, washed two times, permeabilized with 0.1% Triton X-100 in NaCl bath solution for 15 minutes, and then washed two times. The cells were incubated with rabbit polyclonal antibodies to ROMK1 (APC-001; Alomone Laboratories) or PI(4)P5K type I γ (ABS190; EMD Millipore) for 1 hour, washed two times, incubated with either a secondary antibody (Alexa Fluor 594, goat anti-rabbit IgG, 5 μg/ml) or directly with Alexa Fluor 488–conjugated antibody to prominin-1 (53–1331–80, lot: E031633; eBioscience) or Alexa Fluor 488–conjugated CTX subunit B (C34775, lot: 1316686; Life Technologies) at room temperature for 1 hour. To detect the levels of PI(4,5)P2, mpkCCDc14 cells were transiently transfected with pleckstrin homology domain of phospholipase C δ1 tagged with EGFP [EGFP-PHD-PLCδ1; a PI(4,5)P2 marker]. The experiments for localization of cholesterol and PI(4,5)P2 were carried out in live cells. Before the confocal microscopy experiments, the cells were washed two times with NaCl bath solution. Immediately after each experimental manipulation, the polyester membrane that supports the mpkCCDc14 cell monolayer was quickly excised and mounted on a glass slide. Optical scanning of mpkCCDc14 cells near the apical membrane was accomplished with an Olympus FV-1000 confocal microscope within 3 days for fixed cells or 10 minutes for live cells. In each set of experiments, images were taken using the same parameter settings, including gain, contrast, and pinhole. To quantify colocalizations, the image analysis program FIJI ImageJ was used. Both Pearson and Manders coefficients were calculated. To determine whether ROMK1 is located in lipid rafts, we performed sucrose gradient experiments like we reported previously.44 Briefly, mpkCCDc14 cell suspensions were homogenized in 0.5% Brij 96V (Sigma-Aldrich) and 10 mM Tris-HCl (pH 7.5), 150 mM NaCl, 5 mM EDTA, 2 mM Na vanadate, and protease inhibitor cocktail buffer (TNEV) on ice for 30 minutes. Supernatant (500 μl) was mixed with an equal volume of 80% sucrose in TNEV and transferred into a centrifuge tube (13×51 mm; Beckman Coulter, Palatine, IL); 3 ml 35% sucrose in TNEV was carefully layered on top of the mixture followed by another 1-ml layer of 5% sucrose. The sucrose gradient was then centrifuged in an SW 50.1 rotor (Beckman Coulter) at 34,000 rpm (approximately 110,000×g) for 20 hours at 4°C. After centrifugation, fractions were collected starting from the top and moving to the bottom of the tube. Thirteen fractions (approximately 400 μl) were collected, and equal volumes of each fraction were analyzed by 4%–15% gradient SDS-PAGE and immunoblotted with relevant antibodies. For atomic force microscopy experiments, mpkCCDc14 cells were either left under control conditions or treated with 50 mM MβCD for 30 minutes or 10 μM lovastatin for 12 hours. Then, the cells were fixed with 4% paraformaldehyde in NaCl bath solution for 10 minutes at room temperature before detection with atomic force microscopy. Scanning ion conductance microscopy experiments were carried out; the method was described previously.45 We used live mpkCCDc14 cells cultured like those used in patch-clamp experiments and some of confocal microcopy experiments for labeling PI(4,5)P2. All Western blot experiments were performed using either cell lysates or kidney tissue. Methods for preparing cell lysates are the same for mpkCCDc14 cells and kidney tissue. In situ biotinylation of the apical membranes of renal tubules was performed like we previously described.26 Either the intact apical membrane of control mpkCCDc14 cells containing both microvilli and planar regions or the apical membrane without microvilli (eliminated with MβCD as depicted in Figure 5C) was biotinylated and collected. These membranes and lysates from MβCD-released vesicles containing microvilli were loaded and electrophoresed on 10% SDS-PAGE gels for 60–90 minutes. Gels were blotted onto polyvinylidene fluoride membranes for 1 hour at 90 V. After 1 hour blocking with 5% BSA-PBST buffer, polyvinylidene fluoride membranes were incubated with primary antibodies of rabbit polyclonal antibody to ROMK1 (APC-001; Alomone Laboratories), mouse mAb to prominin-1 (CD133, clone 17A6.1, MAB4399; EMD Millipore), or rabbit polyclonal antibody to PI(4)P5K type I γ (ABS190; EMD Millipore) overnight at 4°C and then incubated with horseradish peroxidase-conjugated goat anti-rabbit or rabbit anti-mouse IgG secondary antibodies (1:5000 dilution; GE Healthcare) for 1 hour after four vigorous washes. Finally, blots were visualized with chemiluminescence using the ECL Plus Western Blot Detection System (GE Healthcare). The ANOVA for multiple comparisons was used for comparison among multiple groups. One-way ANOVA was used for multiple groups with one factor, whereas two-way ANOVA was used for multiple groups with two factors with Tukey postanalysis. Data are shown as means±SDs. A P value <0.05 is considered statistically significant. We thank B.J. Duke for assistance in cell culture, Prof. Tong Wang at Yale University for her kindness in providing the kidney tissue from ROMK knockout mice, and Prof. Paul Welling at University of Maryland Medical School for providing an ROMK antibody. This work was supported by Department of Health and Human Services, National Institutes of Health Grants 5R37-DK037963 (to D.C.E.) and 5R01-DK067110 (to H.-P.M.) and National Natural Science Foundation of China Projects 81130028 (to B.-Z.S.) and 31210103913 (to B.-Z.S.). B.-C.L. and L.-L.Y. contributed equally to this work. This article contains supplemental material online at http://jasn.asnjournals.org/lookup/suppl/doi:10.1681/ASN.2013121326/-/DCSupplemental.